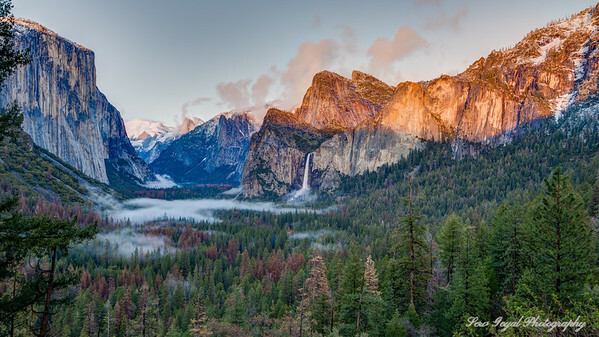 One of my favorite spots, the Tunnel View at sunset. Elcapitan on the left, Half Dome in far center, 'Three Brothers' on the right, Bridal Veil Falls providing drama, and the lush valley floor. I stayed here for 2 hours and watched the clouds roll in and out. Fog finally built up and blanket the valley. Yosemite National Park, CA. Available sizes (inches) - 16x29, 20x36, 24x43, 30x54, 40x72, 50x90 Available print surfaces - Metal, Canvas, Acrylic with some restrictions. Please contact me for details. 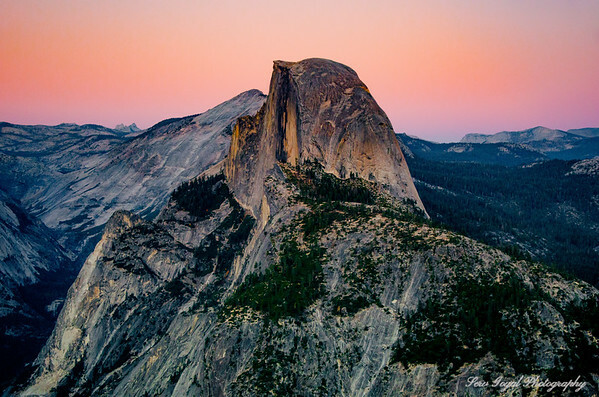 A later sunset over Half Dome as seen from Glacier Point. 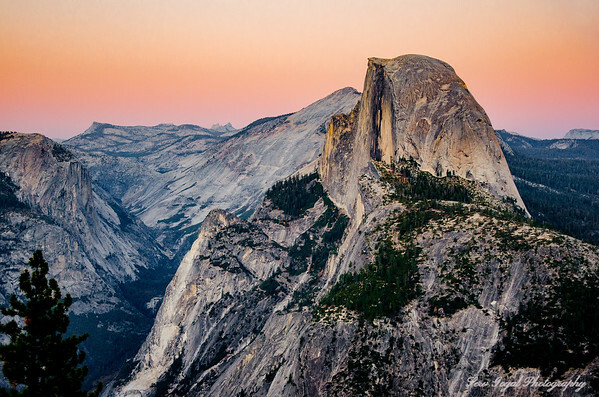 One of my favorite and grand images of Yosemite, Half Dome really captures the magnificence of this great park. 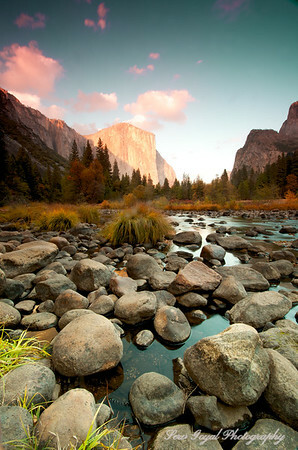 Low water levels of Merced river reveal boulders and make for an interesting foreground with Elcapitan glowing in the early sunset light. With the record rain fall of 2016, all these boulders are now under 2 feet of water. Available sizes (inches) - 16x24, 20x30, 24x36, 30x45, 40x60, 60x90 Available print surfaces - Metal, Canvas, Acrylic with some restrictions. Please contact me for details. 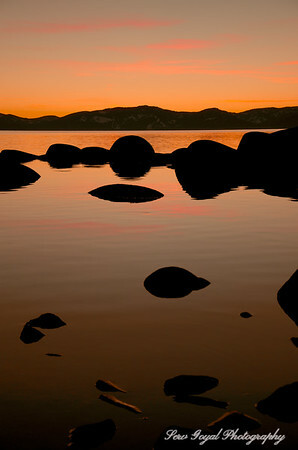 The Bonsai rock in north Lake Tahoe is a magical place for sunsets. 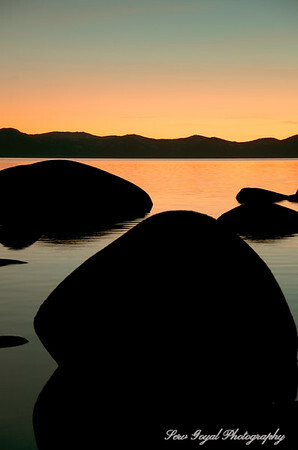 This place represents countless opportunities to enjoy the wonderful reflective properties of Lake Tahoe. Here I captured the last fleeting moments of a sunset resulting in almost pure silhouette of all the rock formations. Available sizes (inches) - 16x24, 20x30, 24x36, 30x45, 40x60, 60x90 Available print surfaces - Metal, Canvas, Acrylic with some restrictions. Please contact me for details. 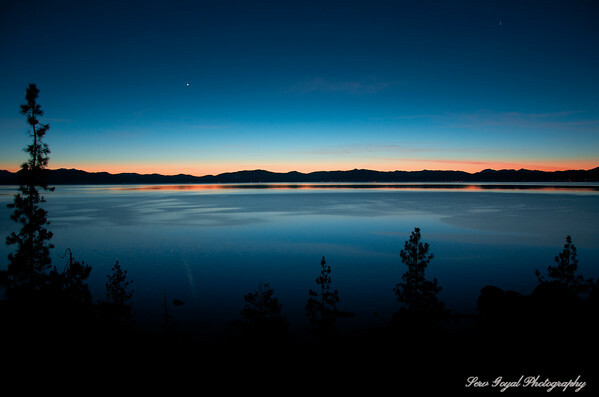 A very late fleeting sunset at North Lake Tahoe. Lake Tahoe's clear alpine waters provide some of the best reflections I've seen anywhere. Available sizes (inches) - 16x24, 20x30, 24x36, 30x45, 40x60, 60x90 Available print surfaces - Metal, Canvas, Acrylic with some restrictions. Please contact me for details. 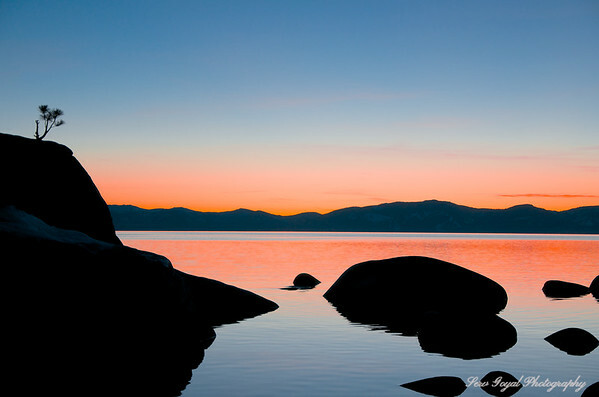 One of my favorite sunsets to watch on Lake Tahoe. This scenic and dynamic landscape is a result of gorgeous rocks and an enclosed harbor providing still waters. This area shows just how colorful the lake can get. The Bonsai Rock - named after the small pine tree growing out of the large boulder. I love to visit this spot to shoot in different light and climate conditions due to its unique rock formations. The half sunk boulders in middle of pictures appear to be floating in water. Available sizes (inches) - 12x36, 20x60, 30x90. Image ratio is 1:3, other custom sizes available upon request. For example - 24x72 Available Finishes - Please contact me. 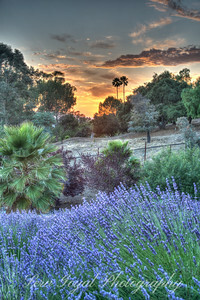 Sometimes classic photographic lenses provide just the right feel and effect to a scene. I shot this with my 15 yr. old Nikkor 28-105mm without the advanced ED and Nano coatings of new Nikon lenses, and loved the resulting flare. The latest lenses are designed to eliminate the flare that you see here. I like to have a bit of everything in my photo kit. This is a panorama stitched from 3 portrait shots. Available sizes (inches) - 12x36, 20x60, 30x90. Image ratio is 1:3, other custom sizes available upon request. For example - 24x72 Available print surfaces - Metal, Canvas, Acrylic with some restrictions. Please contact me for details. Majestic valley floor flanked by red sandstone giants. 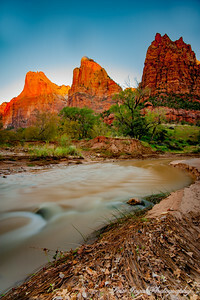 Sunrise on a very chilly morning in Zion National Park. 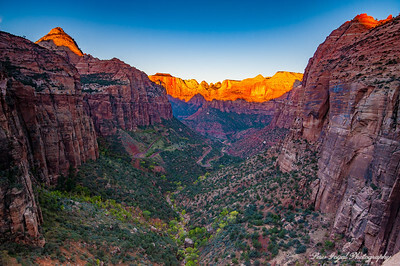 Notice the Zion switchbacks at the center. Available sizes (inches) - 16x24, 20x30, 24x36, 30x45, 40x60, 60x90 Available print surfaces - Metal, Canvas, Acrylic with some restrictions. Please contact me for details. A later sunset over Half Dome as seen from Glacier Point. 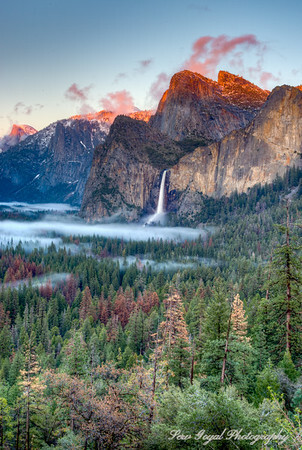 One of my favorite and grand images of Yosemite, Half Dome really captures the magnificence of this great park. Available sizes (inches) - 16x24, 20x30, 24x36, 30x45, 40x60, 60x90 Available print surfaces - Metal, Canvas, Acrylic with some restrictions. Please contact me for details.